The new Visual Arts facility for the University of Iowa’s School of Art and Art History provides 126,000-sf of loft-like space for all visual arts media, from ancient metalsmithing techniques to the most advanced virtual reality technologies, including Ceramics, 3D Design, Metal Arts & Jewelry, Sculpture, Printmaking, Painting & Drawing, Graphic Design, Intermedia, Video Art, and Photography. Also housed are galleries, faculty offices, an outdoor rooftop studio, and teaching spaces for Art History. The Visual Arts Building replaces an original arts building from 1936, which was heavily damaged during a flood of the University of Iowa campus in June 2008. 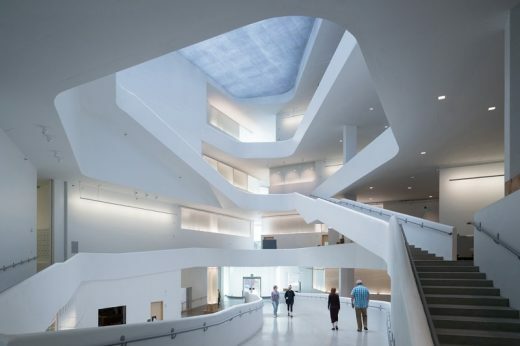 The new building forms an Arts Quad with Art Building West, which was designed by Steven Holl Architects and has drawn students from all over campus to its social spaces and library since opening in 2006. Together they form a visual arts campus for theorizing, teaching and making art. While the 2006 Arts Building West is horizontally porous and of planar composition, the new building is vertically porous and volumetrically composed. The aim of maximum interaction between all departments of the school takes shape in social circulation spaces. 1. Interconnection: Horizontal Programs, Vertical Porosity | In a school of the arts today, interconnection and crossover, made increasingly possible through digital techniques, are of fundamental importance. Interdisciplinary collaboration between the School’s various art departments is facilitated in the vertical carving out of large open floor plates. Students can see activities ongoing across these openings and be encouraged to interact and meet. Further interconnection is facilitated by glass partitions along the studio walls adjacent to internal circulation. 3. Stairs as Vertical Social Condensers: Corridors as Horizontal Meeting Spaces | Stairs are shaped to enable informal meeting, interaction and discussion. Some stairs stop at generous landings with tables and chairs, others open onto lounge spaces with sofas, for informal collaborative work. 5. Material Resonance, Ecological Innovation | Natural ventilation is achieved via operable windows and skylights. A punched concrete frame structure provides thermal mass at the exterior while “bubble” slabs provide radiant cooling and heating. A Rheinzink skin in weathering blue-green is perforated for sun shade on the southwest and southeast. Structural Engineers: Buro Happold and Structural Engineering Associates, Inc.
Curtain Wall Consultants: WJ Higgins & Co.
Audio/Visual Consultants: The Sextant Group Inc.
September 27, 2013: Iowa City, Iowa – The new Visual Arts Building at the University of Iowa celebrates the beginning of construction today. 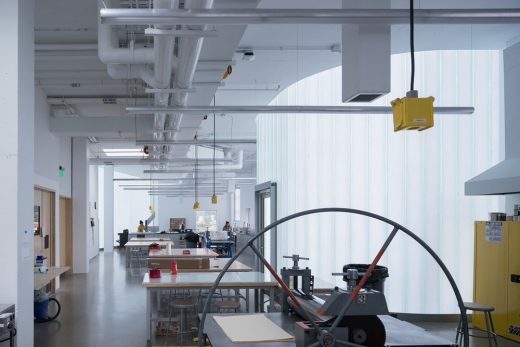 Designed by Steven Holl Architects in collaboration with BNIM, the new facility for the University of Iowa’s School of Art and Art History will provide 126,000 sf of loft-like space for the departments of ceramics, sculpture, metals, photography, print making, and 3D multimedia. It will also include graduate student studios, faculty and staff studios and offices, and gallery space. The new Visual Arts Building relocates and expands educational space from the original 1936 arts building, which was heavily damaged during a flood of the University of Iowa campus in June 2008. The new building will be located directly adjacent to and northwest of Art Building West, which was designed by Steven Holl Architects and has received numerous awards since its opening in 2006. While the 2006 Arts Building West is horizontally porous and of planar composition, the new building will be vertically porous and volumetrically composed. Natural light and ventilation are inserted into the deep floor plates via multiple centers of light. The aim of maximum interaction between all departments of the school takes shape in social circulation spaces. Seven vertical cutouts encourage interaction between all four levels. These light courts are characterized by a language of shifted layers where one floor plate slides past another. This geometry creates multiple balconies, providing outdoor meeting spaces and informal exterior working space. Interior stairs stop at generous landings with tables and chairs, and lounge spaces with sofas. 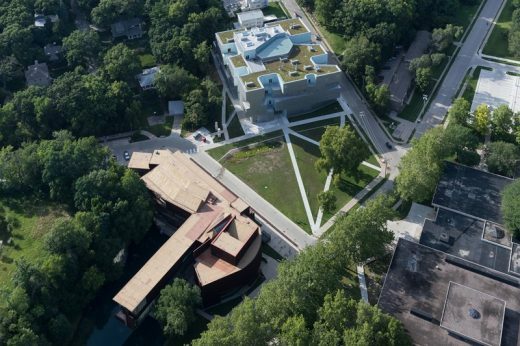 The project, led by Steven Holl and Chris McVoy, is scheduled to open in 2016. 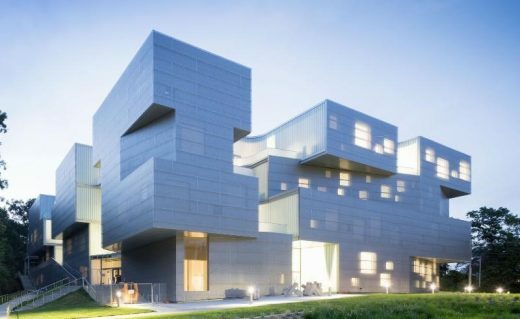 Steven Holl Architects and BNIM were selected as the winning team to design the new Visual Arts Building in a competition organized by the University in 2010. The LEED Gold building includes an accessible green roof, and integrates active slab heating and cooling into the exposed loft-like concrete bubble deck structure.